Boulton Paul Defiants of 264 Squadron engage Heinkel 111s of III/KG51 over Dunkirk on the second day of Operation Dynamo, 27th May 1940. 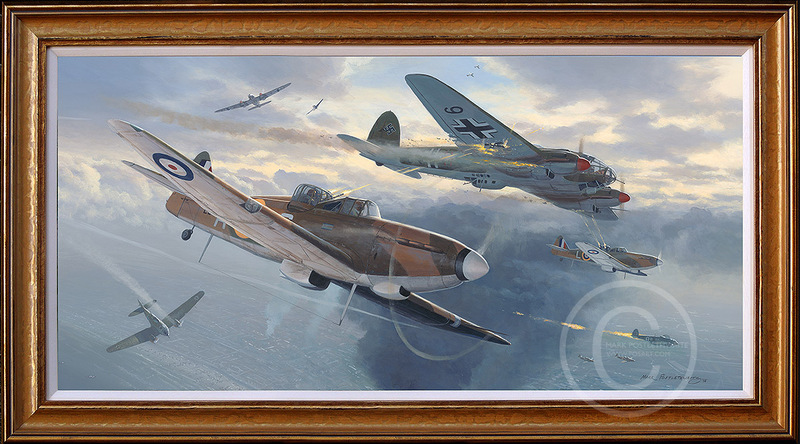 “This final painting of the three shows Squadron Leader Phillip Hunter in L6973 PS-A under the starboard wing and Pilot Officer Young under the port wing in L7003 PS-L pouring fire into a Heinkel by flying in the bomber’s blind spots. This tactic also proved to be a success for other crews on this day and was one of many pre-planned attack profiles that the squadron had practiced." The frame is for illustrative purposes only. All original paintings are supplied unframed for ease of transport but framing can arranged if required. The price may be negotiable, please contact the artist for more details.